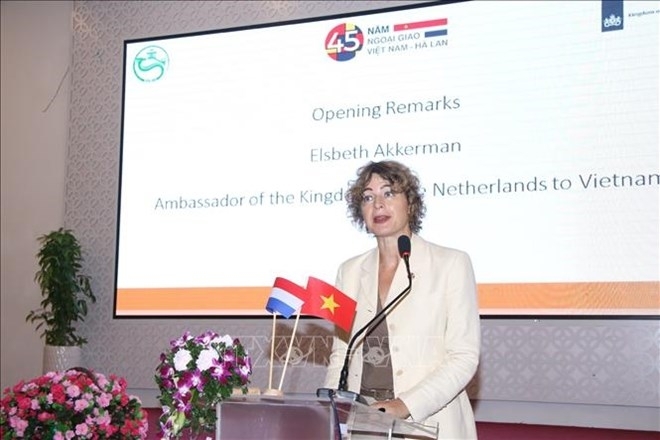 The Netherlands is keen on cooperating with the Mekong Delta region and Vietnam in general in boosting commercial agriculture growth in a manner beneficial to both humans and the environment, stated Dutch Ambassador to Vietnam Elsbeth Akkerman on November 9. 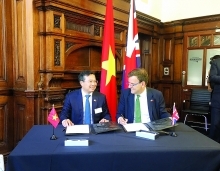 The diplomat noted that the Netherlands and Vietnam share many similarities in geography, such as a coastal delta where the majority of the population live on agriculture. As such, the two countries face similar challenges with flooding, water pollution, saltwater intrusion, and the protection of coastal ecosystems and wetlands, she added. Dutch experts, including Martijn van de Groep, Arjo Rothuis, and Tanya Huizer, cited the joint research by scientists from the Netherlands and Can Tho University as saying that the Mekong Delta region is depressing with increasingly rapid speed. The major reason behind the situation is the overexploitation of underground water resources, the pumping of water, the construction of tall buildings, the deforestation, and the building of hydropower dams, they noted. The experts underscored the need to strengthen the development of high-technology agriculture which can make more effective use of water resources and combine agricultural production with services, ecotourism, and support industries. Sustainable agricultural production must be friendly to the environment and farmers, they said, stressing the significance of ceasing the use of environmentally-harmful chemicals in farming and developing value chains to minimise losses during the harvest and processing procedures, producing safe food from the fields to the dining table. Meanwhile, Vietnamese experts gave solutions to applying science and technology in agriculture and orientations in developing agriculture to adapt to climate change. They underlined the need to build systems to treat industrial and household wastewater and develop build-operation-transfer projects to attract investment from the private sector in building treatment plants.